JNN 07 June 2014 Kabul : The front-runner in Afghan’s presidential election, Abdullah Abdullah, has survived a suicide bomb attack targeted at his convoy in Kabul. Police told the BBC that six people were killed – including one of Mr Abdullah’s body guards – and at least 22 injured when two blasts hit a rally. Abdullah’s campaign team confirmed the incident and said two blasts took place in Kote Sangi area of Kabul city near Ariana Hotel. He appeared live on television to reassure his supporters that he was unharmed in the attack. The run-off round of the presidential election takes place next week. No group has said it carried out the attack but the Taliban have repeatedly threatened to target the poll campaign. 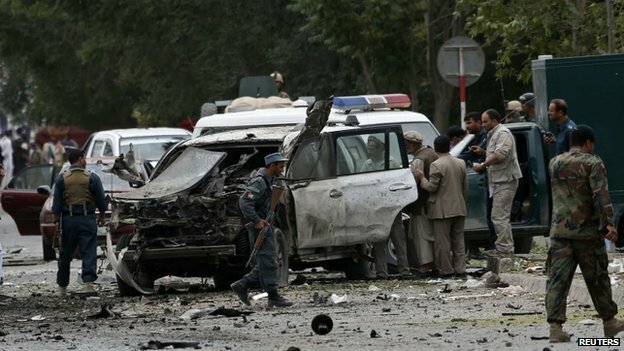 The first blast was detonated by a suicide bomber in a car, a Kabul police spokesman told the BBC’s Bilal Sarwary. The spokesman said the second explosion was probably caused by what he described as a “sticky bomb” but our correspondent says details about it are still unclear. The dead and injured include policemen and civilians. Correspondents say that this appears to be the first attack on a presidential candidate since the campaign began. Both the two presidential candidates are holding several rallies daily in Kabul and across Afghanistan. The attack took place as Mr Abdullah was leaving an election gathering in a wedding hall. Eyewitnesses described scenes of panic and chaos after two loud explosions were heard. Our correspondent says that Mr Abdullah and his colleagues narrowly escaped. “Thank God, we have not suffered any injuries.,” Mr Abdullah told national television. “However, regrettably, a number of security guards were wounded. His opponent in the run-off, Ashraf Ghani, voiced his condemnation of the attack on Twitter. The run-off is set to take place on 14 June after neither candidate managed to secure more than 50% of the vote needed for an outright victory after the first round of voting in April. The winner of next week’s vote will preside over the withdrawal of coalition combat troops. This entry was posted in Jafria and tagged Abdullah Abdullah, afghanistan, Presidential Candidate, Suicide attack. Bookmark the permalink.